Self-Expression Center - Company Background | Sandra Zimmer, the creator of the Zimmer Method. We create transformational learning experiences that unleash your natural ability to speak, present and communicate authentically. At the Self-Expression Center, we believe that each person has a unique way of expressing that can be both effective and compelling to others. Our mission is to draw out the natural expressive abilities from clients, so they feel confident to share their ideas, insights and expertise authentically to make a difference in their communities, companies and in the world. We fulfill our mission by creating rich, supportive learning experiences and communication skill training where business professionals and sensitive achievers discover and free up their natural communication and public speaking abilities. Our clients learn to overcome stage fright, develop a strong leadership presence, speak from their hearts, tell their stories and articulate their thoughts clearly with beautiful voices. 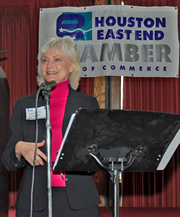 The Self-Expression Center was founded by Sandra Zimmer in Houston, Texas in 1992. Originally, Sandra taught acting for non-actors, transforming stage fright and speaking voice skills. As time progressed, she realized most of her clients were professionals who were using the skills she taught to enhance their careers. With that in mind, Sandra developed a unique approach to public speaking and communication training – offering transformational programs delivered in an environment where people are supported for being authentic not pushed to be mechanically perfect. In Sandra Zimmer Method programs, people are honored for who they are, allowing them to relax, let go of tensions and anxiety that distract them from powerful communication. When people are acknowledged for who they are and what they do well, their natural expressive styles emerge. They begin to shine with confidence and they express themselves more freely and fully which results in greater ability to speak, lead, sell and persuade. Sandra now offers a wide range of coaching and courses at The Self-Expression Center in Houston and at corporate locations around the country. She facilitates programs on public speaking, presentation skill training, transforming public speaking fear, leadership presence, voice & diction, accent reduction, persuasion, video performance skills, interview preparation and communication skills to individuals, small businesses and corporations. Sandra also coaches individuals by telephone and by Skype video. 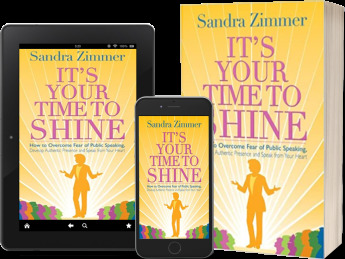 Sandra Zimmer presents short talks and speeches for your organization.